12.2 Velocity Results … Finally! I learned a few things about myself when hosting this type of event, which I will share on the next podcast. don’t make a giveaway so complicated! you forgot how much joy you have in creating the giveaway to begin with if you never work on it! … You want actual results? How fast do we sew? Really? Here’s a copy of the pdf of the google document that I created. 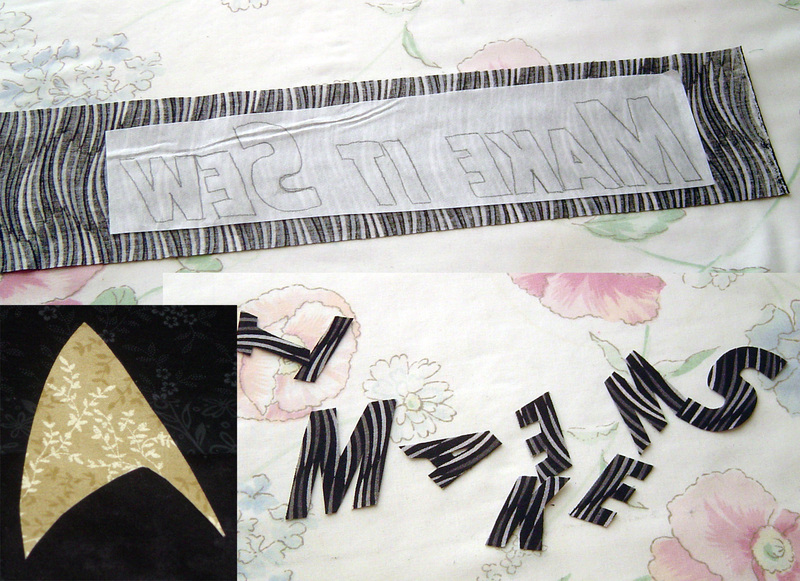 This is not meant to be a display on who can sew fastest when, so I blurred the names here, except mine. The highlighted column ends up being the speed in yards / minute as I have calculated. I hope I got all the kinks worked out on the yards / minute calculation. Actual conclusions (to the data, not to how I mishandled the giveaway and experimental results). 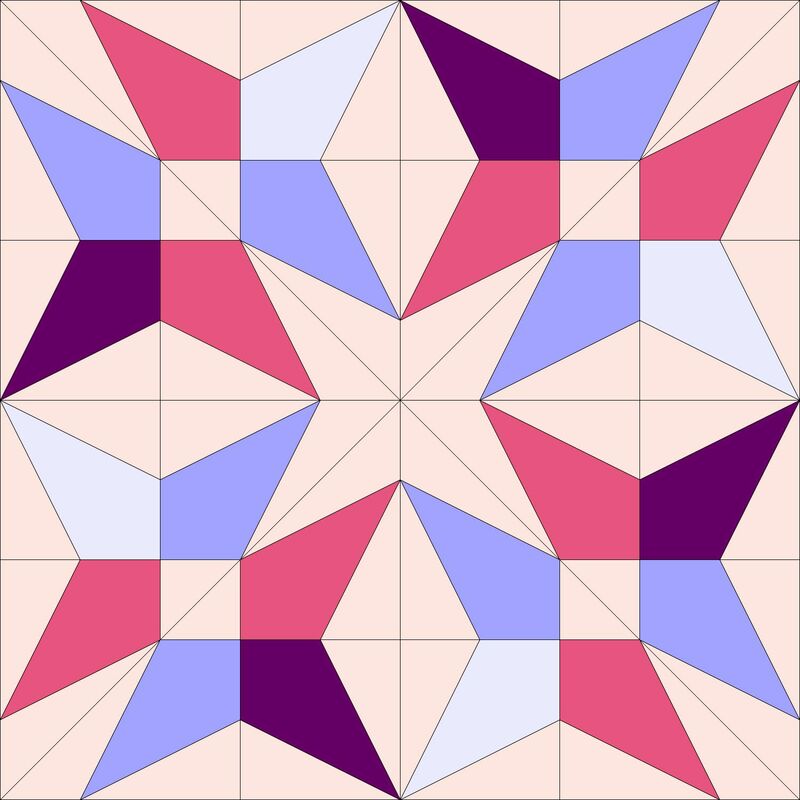 Two quilters sewed faster when sewing full length strips rather than sewing blocks. MY speed was the slowest of them all when it came to sewing blocks. 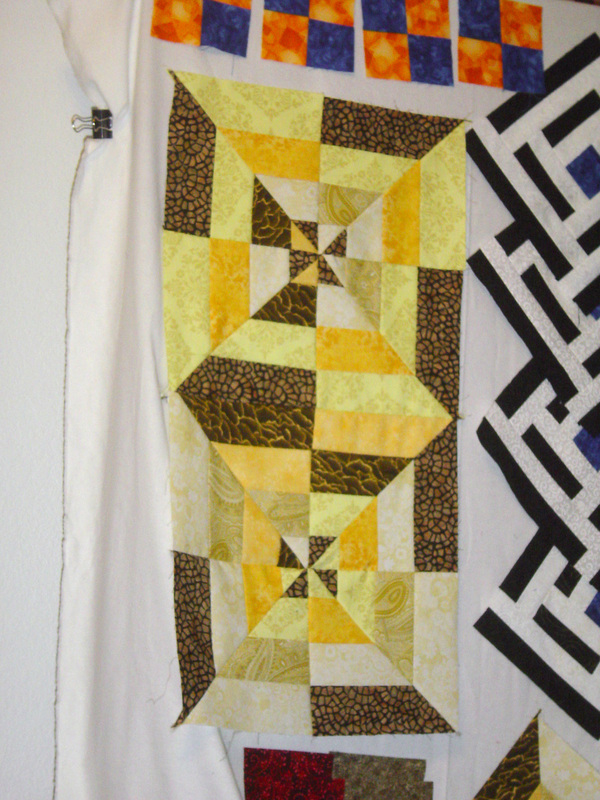 And right now I can’t remember if I actually sewed two pieces of 2 and a half width blocks instead of one piece. If I sewed a length of 5 inches instead of 2.5 then my speed would be much closer to the speed of sewing everything else. Sometimes cats, ironing, threadies under the fabric get in the way and slow us down. The width of the strips DOES matter on speed. 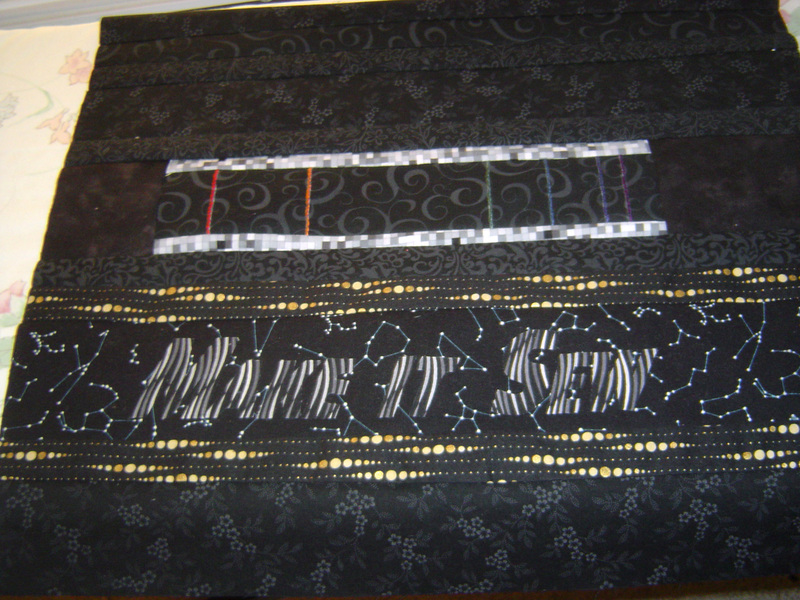 The narrow 1.5 inch strips are slower on all quilters who attempted them, and the fastest speed is on 8.5 inch blocks. Some people get in a rush when trying to time themselves and cause themselves more trouble than they would otherwise. The average speed of all the results is 1.36 yards / minute. We can sew just about 1 and 1 third yards of fabric in a minute’s time. And do it accurately. Feel free to continue to participate and now that I have the database set up better, I can hopefully reply much faster (get it – faster?) with the velocity. For the giveaway, I assigned each trial that people timed a separate # and then used the random number generator to determine the winner of the giveaway. Sending you an e-mail Janet, hope to get in contact with you soon! Well … so much for a quick project. This is quickly turning out to be one complicated mess, a very long and fulfilling project that will make me leap with happiness if when it gets completed. 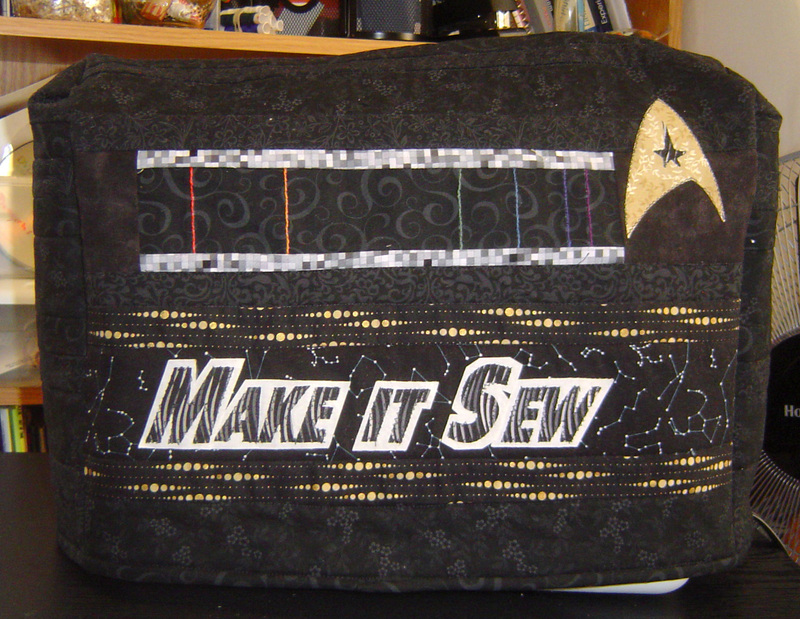 The sewing machine cover could not have had one single fabric color, the make it sew letters had to “match” the space theme. Here are my letters, and see I even made them BACKWARDS (which fixes my problem!)! And these letters would look fantastic if I was setting them on white (or near white) background like my ironing board (repurposed bed sheet from goodwill). 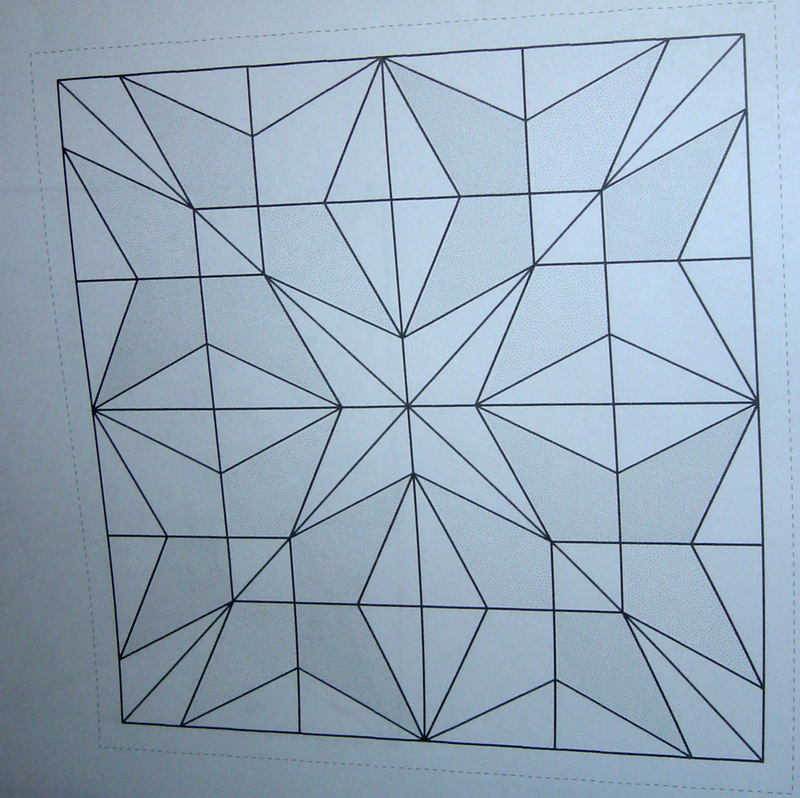 I was hoping the white in the pattern would make it work, but … now I am not so sure. I could embroider around in a color like red or gold. But I would be afraid I would lose my sharp edges with that technique. I should have backed the design in white instead. Maybe probably. But now they’re stuck on with fusible. Or maybe try paint sticks … oh wait, I don’t have paint sticks. 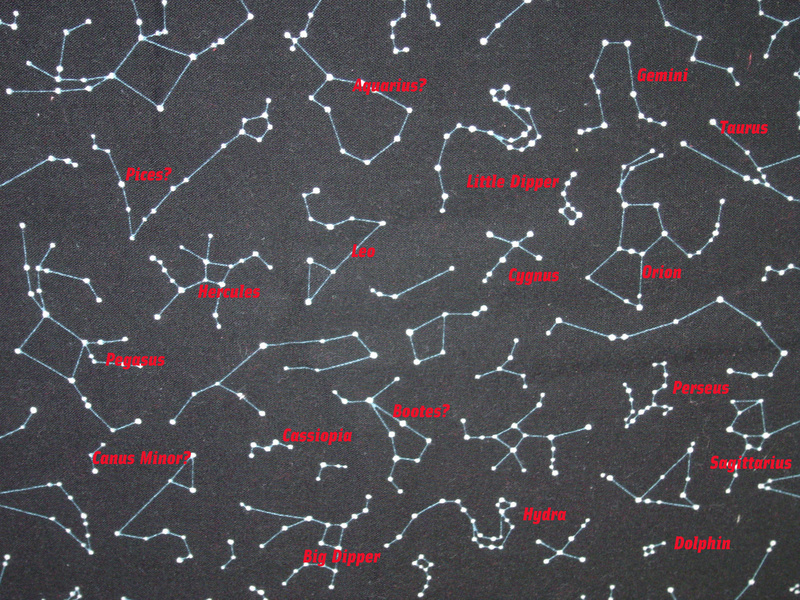 I also ALMOST used plain black fabric for the word outline, but “I wanted something starry and that was the best place to put my stellar fabric”. I do have the sides done and ready to be basted. 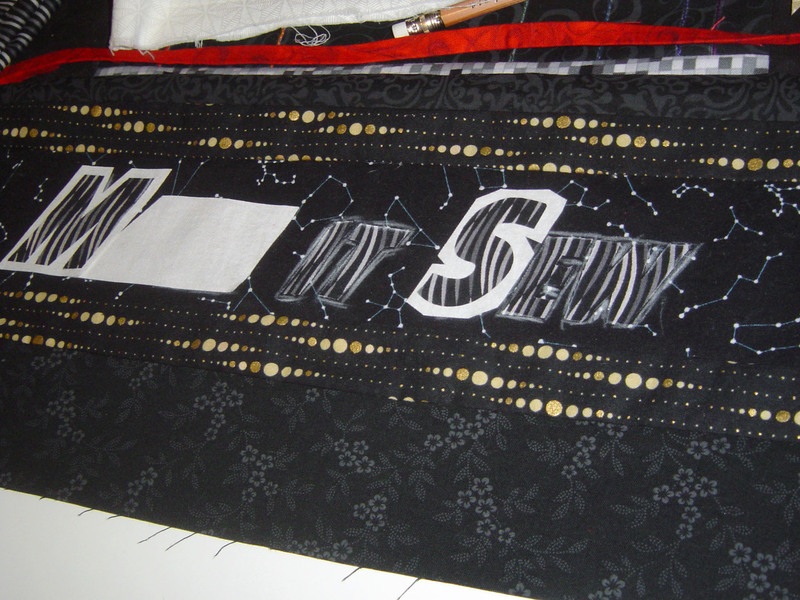 If/when I fix the letters (they may just stay halfway unreadable – for style purposes), I’ll have to baste & quilt the main body and the sides. 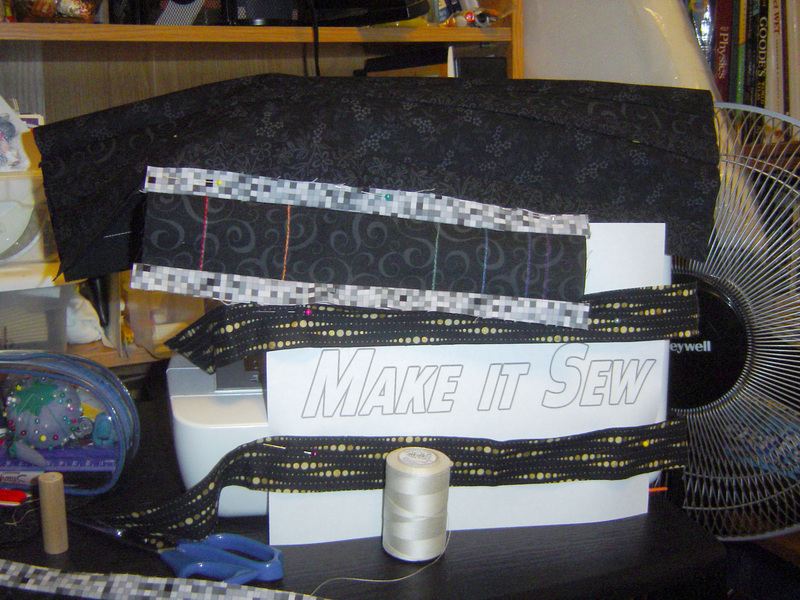 Then sewing the pieces together will be almost all that’s left. 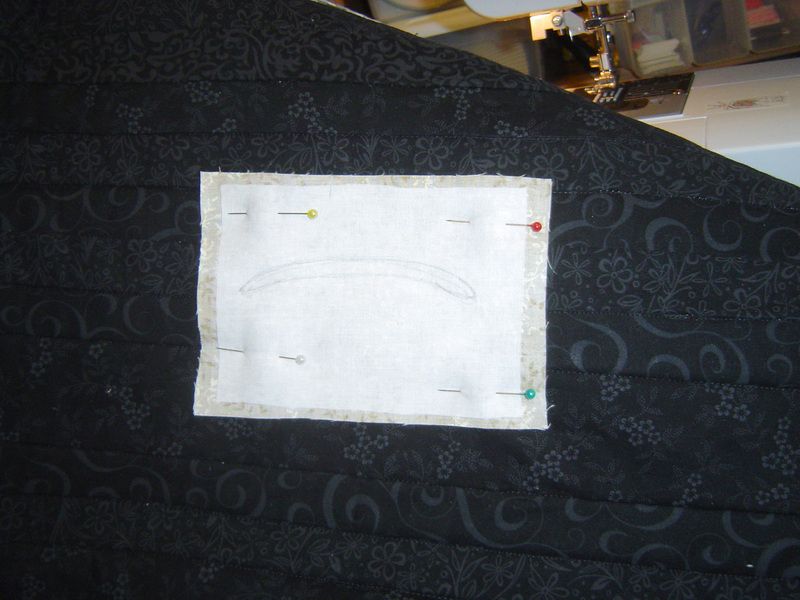 Oh and binding around the bottom. Oh yeah, I may want a slit in the top of the cover. 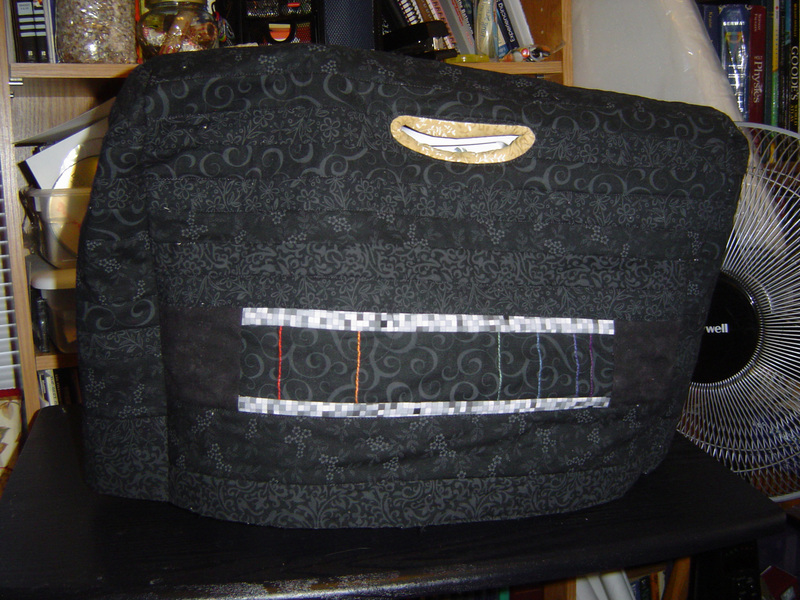 Flickr inspiration for this sewing machine cover (tutorial for structure, not content) found at FlossieBottom’s Sewing Machine Cover Tutorial. That’s my friday night sew-in thingy that I’ve seen other people do. 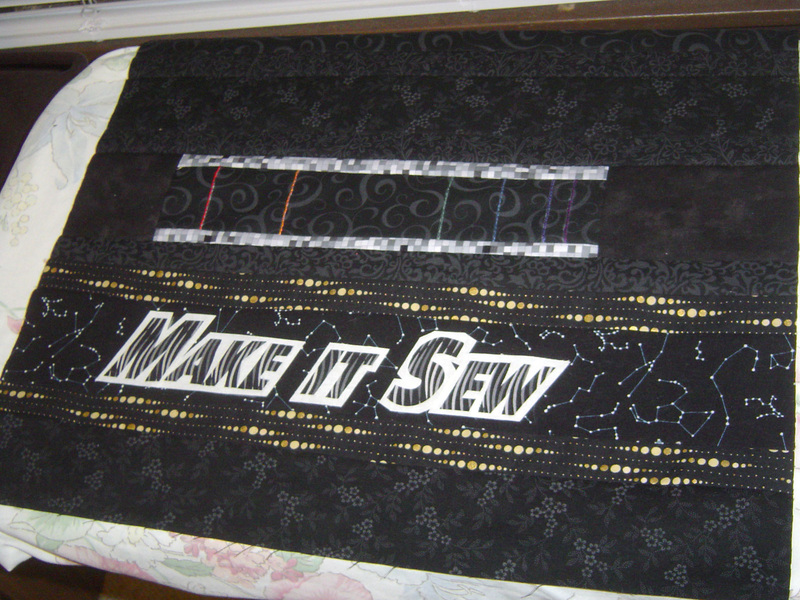 (yes, it qualifies as sewing until about bedtime for me, so it would count – if I were doing that, and if it were the right week for it). 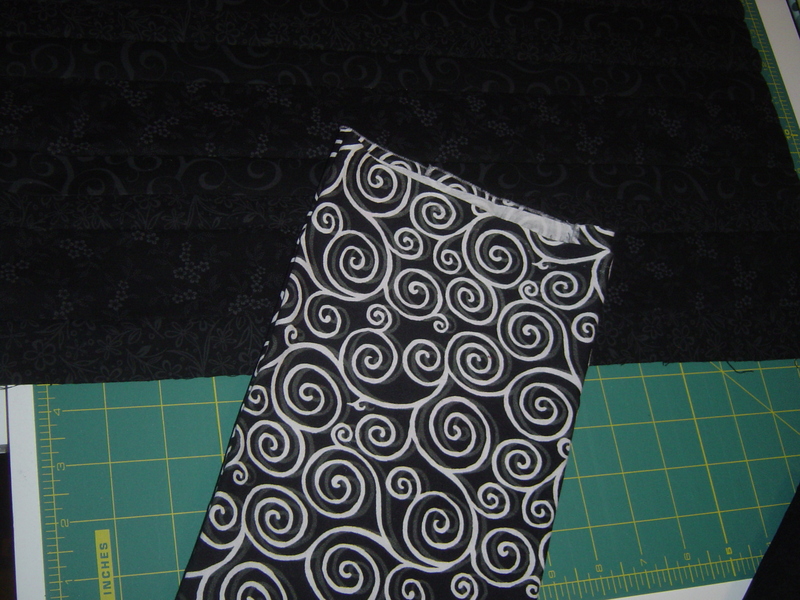 I wasn’t sure when I pulled out this fabric if I could do it. This fabric is called “space: the new frontier” by benartex. Looking at the fabric, I thought, maybe I could remember them. My old friends. I remember a few that I don’t see on here (I think). The northern crown (corona borealis), the big dog (canus major). And one of these, I wonder if the lines aren’t drawn slightly differently. There was a king and he was a group of 5 strong stars of a pentagon and you can see him near the twins in the night sky. 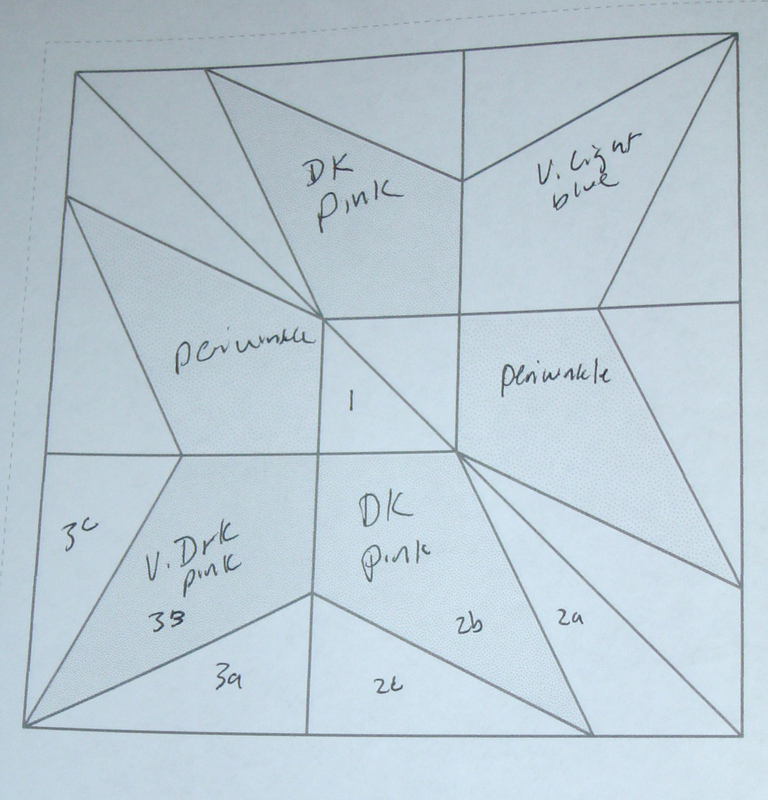 I always thought he looked like a house, so the “kite looking thing near the center,” I wonder if that’s him, which is not exactly how the lines I knew were drawn. If that’s not something else I am forgetting. The constellations aren’t grouped together correctly on here, I can’t pick out the summer triangle, nor the winter triangle. Canus minor is a stretch because it is 1 strong star, one medium brightness star, and perhaps one very faint star. But I usually only remember two stars.